April 6, 2017 - Twenty-year-old Sgt. Elchai Teharlev was killed this morning in a car-ramming attack in the central West Bank. Sgt. Elchai Teharlev, 20, from the settlement of Talmon northwest of Ramallah, died of his injuries after being struck by a Palestinian driver. A soldier in the Golani Brigade, Elhai was on duty at the Ofra Junction on Route 60, northeast of Ramallah, when he was attacked. Another soldier was wounded in the attack. The car struck the soldiers as they stood in an opening between the bollards protecting the bus stop and the concrete barrier protecting the rest of the sidewalk. 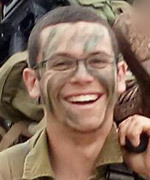 According to officials, the terrorist accelerated into the soldiers from across the street, to maximize the speed of impact. He was posthumously promoted to sergeant from corporal. Elhai Teharlev was buried in Jerusalem’s Mount Herzl military cemetery on Thursday, 6 April at 6:30 p.m. He is survived by his parents, Rabbi Ohad and Avital, and six siblings.